I will be giving a talk on the Internet, and demonstrating this home page, at the April CVA meeting. Because I like this cover label and want to show it to the CVA members, I have decided to continue to use it as this month's primary Anchor illustration. The cover label is from 1908. The decision to illustrate a typical model on the box labels was made during the early years of the first decade of the 1900s. The sets with metal parts pushed the decision to make different labels for different sets. It took several years to extend the idea to the main series of all stone sets. Richter was not at all careful about which illustration was on which box. Usually the building illustrated could not be build with that set, but required at least one supplement set. (Not a legal marketing practice today, I think.) However, with honesty in mind, this illustration is can be built with this set (and, of course, the lower numbered sets [a total of five boxes] it supplements). The languages on this set are German, English, French and Dutch. In this case English was aimed at England, and the market served was the "nord", or northern Europe market. French is included for the Belgium, not French, market. Today, there are many collectors and builders (This page shows some exhibition quality buildings.) 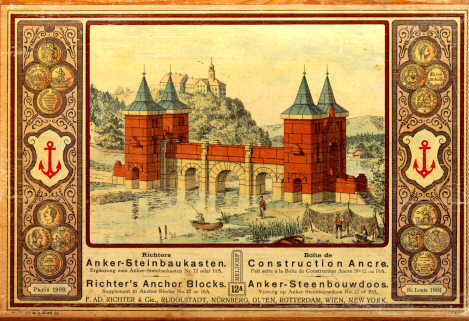 of Anchor Stone Building Sets. These collectors often participate in setting up Anchor displays at varous exhibitions. A number of them are members of the international Club of Anchor Friends (Club van Ankervrienden), a Dutch club with members from the Netherlands, Germany, Austria, Switzerland, Great Britain and the USA. For the month of April, 1997. You are visitor number to the Club of Anchor Friends' home page since the posting date of . From the first appearance of the Anchor home page, August 30, 1996, there has been a slow but steady increase in the number of people accessing it. Over the previous seven months there have been about 1,400 visitors, with about 290 during March. This revision is the ninth one that has been on the net. (My first effort was up only four days, until I learned how to display graphics.) The Date and Time is . I plan to update this site monthly. It was last updated on .